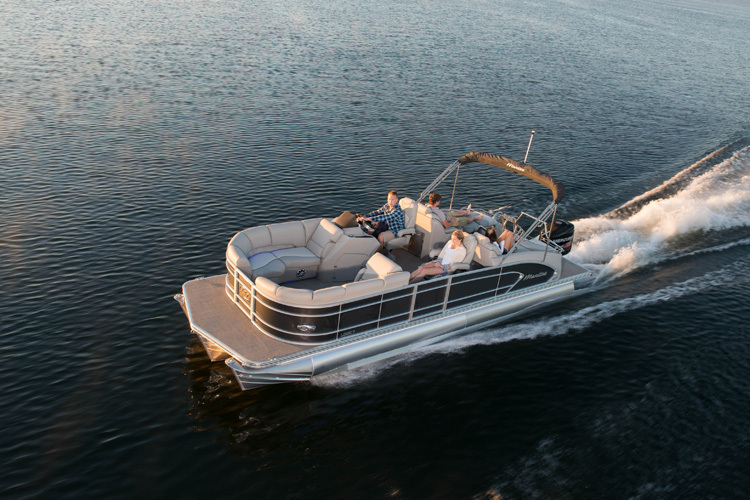 The evolution of the pontoon boat continues, with models that push the limits of performance and handling below deck while pushing the limits of comfort and amenities above. Here are some of our favorites. 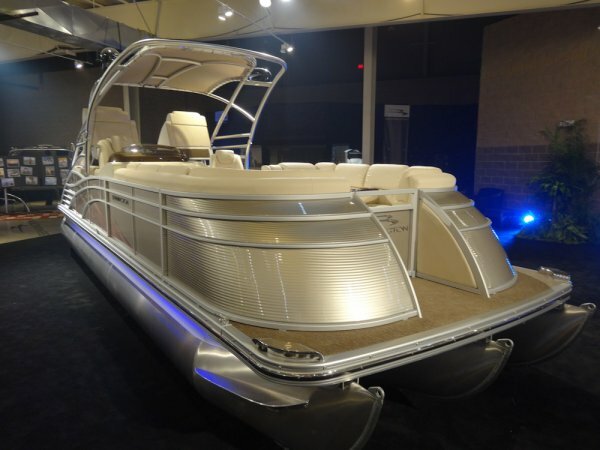 What’s driving innovation among the designers and builders of pontoon boats? Sales. Pontoons are thriving, to the point that these aluminum-based wonders are stealing away customers from the fiberglass market. They’ve got style, they’ve got a coolness factor that grandpa’s party barge only dreamed of, and they’ve got incredible versatility. The same pontoon boat that can take you on that evening cocktail cruise can also take the crew skiing, boarding or tubing, handle a day of fishing, host a party, and in come cases even a high-speed thrill ride. Ready to join the party? Here are our 10 favorites (from largest to smallest) of the year. 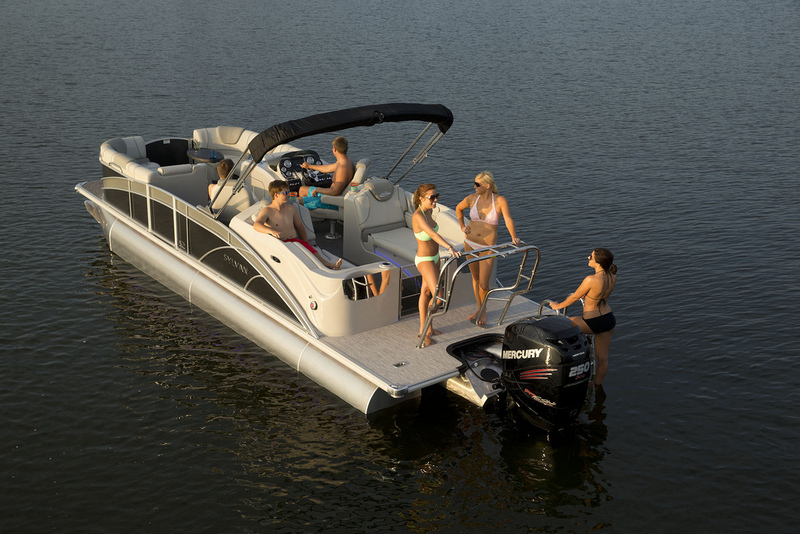 The Premier 290: a Pontoon yacht. Premier 290 Grand View – When it comes to Premier’s 290 Grand View, the name says it all. The source of that “grand view” is an elevated helm platform, raised a full two-and-a-half feet above the forward deck. 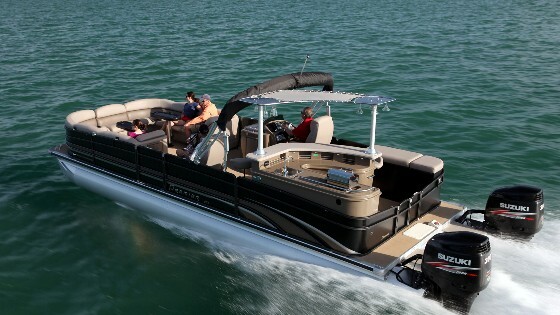 It gives the driver unprecedented vision forward, essential on a 29’ boat, and a cruiser-like feel at the controls. Similarly super-sized is the beam — 10’ 2” — and the available power. With twin 300 hp outboards, expect to reach 30 mph in under 6 seconds and to top out around 52 mph. How’s this big daddy handle? A third, 36” center tube gives the 290 the agile feel of a V-hull. Those looking for the amenities will want to check out the Bombay Bar to starboard, touchscreen helm control, cascading stairs to the swim platform, and — oh yeah —optional joystick docking control. The latter enabled me to crab this behemoth right into a tight slip without fear of dinging a neighbor’s ride. For more information, read our review of the Grand View's sistership, the Premier 290 Grand Entertainer, or visit Premier. Pontoon boat nirvana can be found, on the Sylvan S5. Sylvan S5 - Most pontoon manufacturers are mimicking V-hulls by adding larger center tubes or dropping them lower in the water, but Sylvan’s S5 features the brand’s “Revolutionary Planing Technology”. These shaped logs are actually welded to feature a V-hull-like keel and chines. My test boat, which added an additional 27” center tube, planed instantly, handled aggressively without excessive banking, and topped out at 46 mph with a 250 hp Mercury Verado. It also, however, paid equal attention to the impression above deck. Upscale touches include sweeping fence lines with stainless grab rails above, trendy matte wood-grain at the helm, rich vinyl with contrasting piping, and stainless gates with smoked Lexan inset panels. But I’d argue the best features are the dual recliners, set into molded fiberglass bases aft. Stretch out in comfort while watching the wake, and enjoy cavernous stowage below. For more information, visit Sylvan. The Bennington 2575 QCW is the only stern drive pontoon that made the grade. Bennington 2575 QCW I/O Sport Tower - Outboards have become the norm on pontoons, but every so often a standout sterndrive comes along. For me, the most notable this year is Bennington’s 2575 QCW I/O Sport Tower. 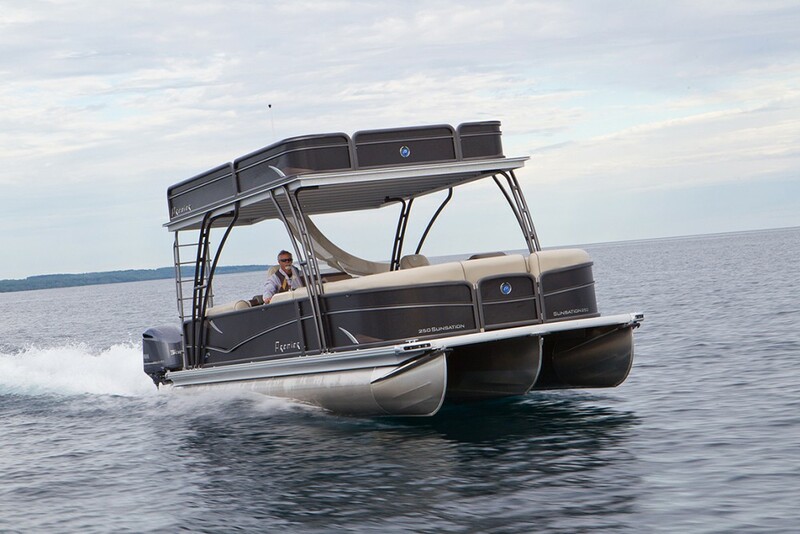 Below, it features the brand’s Elliptical Sport Package (ESP), consisting of 25” outer pontoons with inner performance foils sandwiched around a much larger, 32” elliptically-shaped center tube with lifting strakes. Taking that effect one step further on my test boat was a powerful MerCruiser 8.2-liter Big Block, paired with a Bravo III sterndrive. The end result was some of the most aggressive, v-hull-like handling I've encountered on a pontoon, and a top speed of 52 mph. With its stylish watersports tower and optional “Black Out” package, the 2575 was also one of the coolest looking ‘toons I encountered this year. Within, lush, pillow-top upholstery is the epitome of luxury. For more information, visit Bennington. 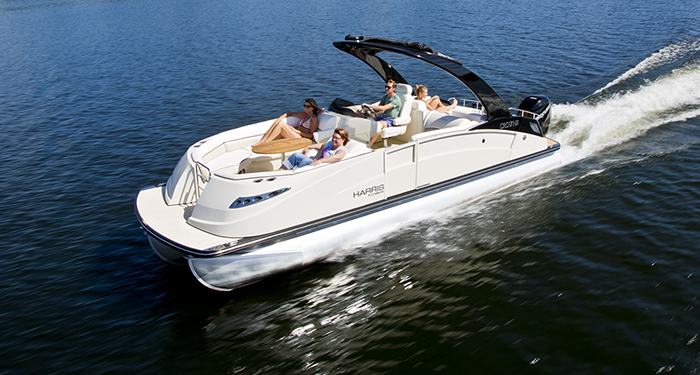 An absence of the fence sets the Harris Flotebote Crowne 250 apart from other pontoons. Harris FloteBote Crowne 250 - Traditional fencing is nowhere to be found on Harris FloteBote’s Crowne 250. Instead, the boat features stylish molded fiberglass seating modules both fore and aft, linked by painted aluminum panels that give the boat the solid exterior appearance of a fiberglass deckboat. Add additional style points if you get the optional Sport Arch, featuring an acrylic sun shade and a retractable Bimini top, or the touch-screen helm display. The latter includes a GPS-based cruise control. That’s some cool stuff, but the basics aren’t forgotten. Comfortable lounges offer plenty of seating throughout, including a pair of aft-facing recliners at the stern. In terms of performance, the Crowne utilizes HFB’s PIII Performance Package. That means triple 25” pontoons below, the middle of which is dropped an inch to produce a V-hull effect. Performance strakes further aid performance. That combo was paired with a Mercury Verado 300 on my test boat, producing a 47 mph top speed. For more information, visit Harris FloteBote. 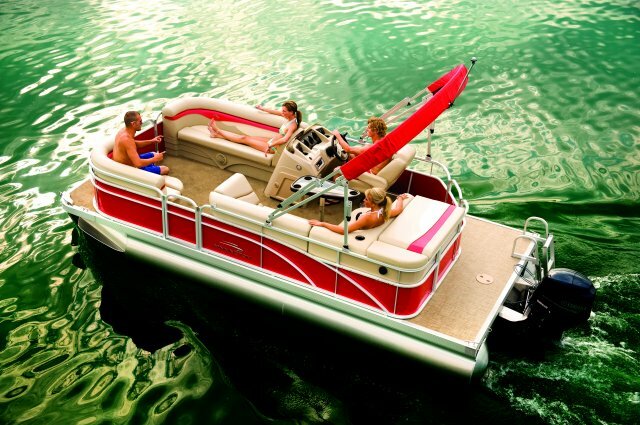 The Manitou Sport Handling package gives this pontoon boat the feel of a V-hull. Manitou 25 Legacy SRS - Manitou is known for performance, and the 25 Legacy SRS is no exception. 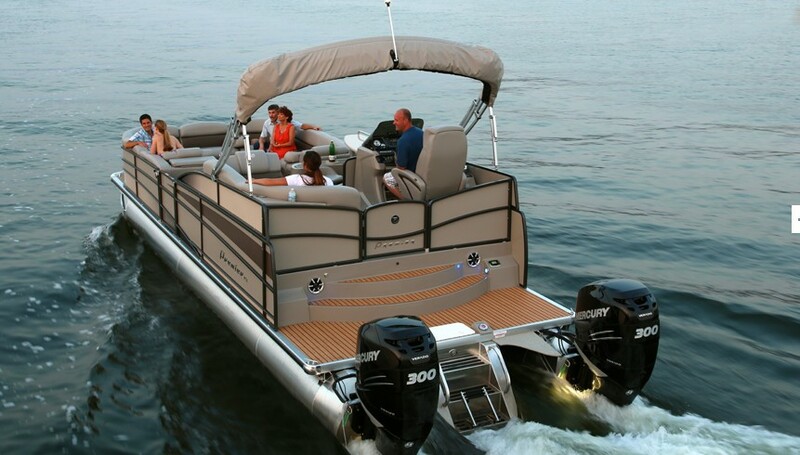 Below the deck, the Sport Handling Package (SHP) combines twin, 23” outer pontoons with a central, 27” center tube that is dropped 5 1/4” deeper into the water. All three get performance strakes, and an aluminum skin smoothes the deck’s underside. Add power-assist steering and you get a boat that is agile and responsive, with the lean-in handling you’d expect from a V-hull. Speed? Throw on a 300 hp Evinrude E-Tec and you’ll push close to 50 mph. Impressive for sure, but perhaps overshadowed by Manitou’s detail above deck. Standouts on my list include the tasteful use of billet aluminum accents throughout, and Manitou’s split-rear seating (SRS) treatment aft. It consists of two pairs of facing seats. Use them in dinette fashion, or pivot the aft backrests over to form two comfy recliners. For more information, visit Manitou. 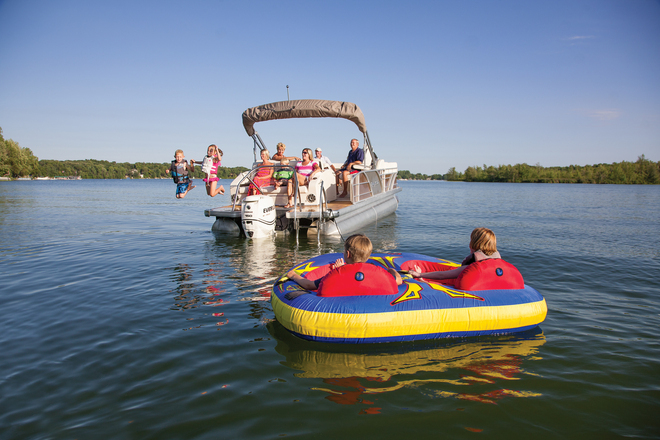 Family boating fun is in order, on the AquaPatio 240 OB Elite. AquaPatio 240 OB Elite - Obviously there’s a lot of attention being paid to aft seating, but sometimes a couch trumps a pair of recliners. AquaPatio’s 240 OB Elite’s offering on the rear deck is nearly 5’ wide, and complemented with speakers and cupholders to keep the party going while you lounge at the sandbar. That couch, however, isn’t just a couch. Touch a switch and its backrest lowers in conjunction with its mirror image forward. Stop the descent in any state of recline, lower it all the way to a sunbed, or pop up the forward cushions to make aft-facing recliners. Forward, more seating awaits, including an L-shaped lounge and parallel lounges at the bow. 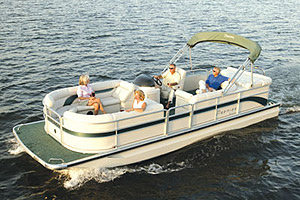 In standard trim, the 240 features twin 27” pontoons. My test boat showed off the optional Performance Package, consisting of an under-deck skin, lifting strakes, and hydraulic steering. With a 150 hp Yamaha, expect a top speed of about 37 mph. For more information, visit AquaPatio. The Lowe Platinum RFL has unusual seating, which sets it apart from the crowd. 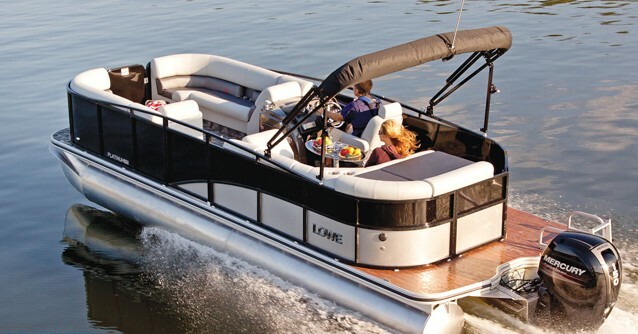 Lowe Platinum 23 RFL - Pontoons promise one big party, but sometimes you want a little separation from the pack. Lowe’s Platinum 23 RFL features multiple seating areas, each with individual personality. Forward, enjoy traditional parallel lounges. Amidship, the captain gets a companion chair opposite the helm. Aft, two oversized, plush chairs (those “rear-facing lounges” referenced in the name) occupy the boat’s final third. Each enjoys an armrest cup holder, and faces its own curved table integrated into the curves of the perimeter fence. As the name implies, the Platinum is upscale. See examples in the rich vinyl and carpet, as well as an oval Plexiglas pedestal table, chrome-accented steering wheel, and Fusion marine audio system. 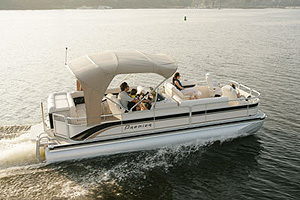 Below deck, twin 25” pontoons carry the boat in standard trim. Add the optional XL Performance Package for an additional center tube, lifting strakes, spray deflector and 50-gallon fuel tank. With a 225 hp Mercury OptiMax 225 Pro XS, top speed hovers around 46 mph. For more information visit Lowe, or read our full review of this boat’s larger sibling, the Platinum 25 RFL. The Cypress Cay Cabana proves top-notch doesn't have to cost top dollar. Cypress Cay Cabana 220 - Cypress Cay’s Cabana 220 walks a fine line, offering upscale amenities while maintaining a mid-level price. Examples of the former are found in the pillow-top seating, trendy matte finish on the cockpit tables, speaker bezels and dash inlays, a handy five-step ladder that extends deeper into the water for easier boarding, and excellent construction details. Examples of the latter include exposed rotomolded seatbases, but I’m betting a savvy buyer will willingly accept the tradeoff...especially when there’s so much of that pillow top to be found. Seating literally wraps the entire perimeter, allowing a big crowd to join the fun. While standard as a twin tube, the Cabana can be upgraded to the TIII Performance Package, which adds a third tube dropped an inch below the outer logs. Performance strakes and aluminum underskin complete the offerings. With a Mercury 150, look for agile handling and a top speed just shy of 38 mph. For more information, visit Cypress Cay. Bennington 21 SLX: small package, big luxury. Bennington 21 SLX - Bennington may have a reputation for high-end luxury, but the brand’s 21 SLX can be had with a Yamaha 90 outboard for a little over $20,000. For the money, you get a hint of the luxury found in pricier models. The soft-touch vinyl seat coverings on the multiple lounges are the same basic material found throughout the line. Below, you also get similar rotomolded seat bases, which are low maintenance and durable. They’re exposed, rather than vinyl-covered, but feature upscale molded contours and precise color-matching. The SLX also features a one-piece fiberglass helm console, stainless-steel hardware and fittings, and a generous aft platform. Options include pillow-top upholstery and woven flooring. 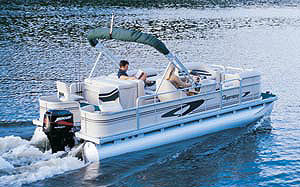 Below deck, 23” pontoons provide a smooth ride, but can be upgraded all the way to 32” ellipticals. Power choices go to 150 hp, but a 90 should be more than adequate to push the boat to a top speed just shy of 28 mph. For more information, visit Bennington. Finally, a boat that costs less than a car: the Sun Tracker Bass Buggy 16. Sun Tracker Bass Buggy 16 DLX - Luxurious amenities are sweet, but sometimes it’s just about getting your family out on the water as reasonably as possible. If that’s your mission it’s hard to beat the Sun Tracker Bass Buggy 16 DLX, which we liked so mush we named it among the Top 10 two years running. As you might expect, the Bass Buggy has an emphasis on fishing. You get a bow casting deck with twin fold-down fishing chairs, an aerated livewell below the forward console seat, and a space for your gear and tackle. Yet, the Buggy doesn’t forget the family. There’s seating for seven, and stowage for the stuff they bring aboard. 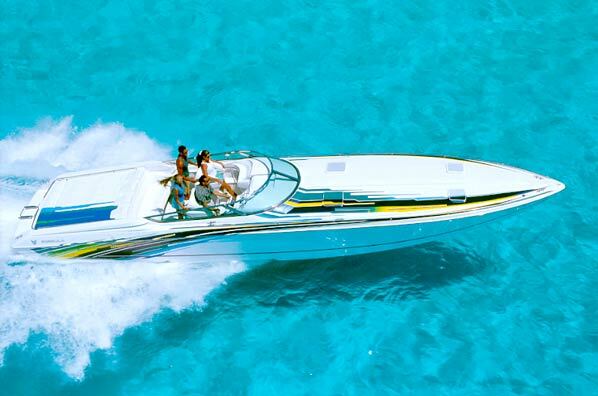 Perhaps the boat’s most compelling feature, however, is its bargain price tag. The Bass Buggy can be had with 20” pontoons and a 20hp four-stroke outboard for only $10,595. That makes it one of the most affordable choices in boating. And don’t worry, corners aren’t cut. Sun Tracker borrows components from other boats in the line to make a boat that will last far longer than your payments. For more information visit Sun Tracker, or read our review, Sun Tracker Bass Buggy 16: A Pontoon Boat For under $10,000: YES! 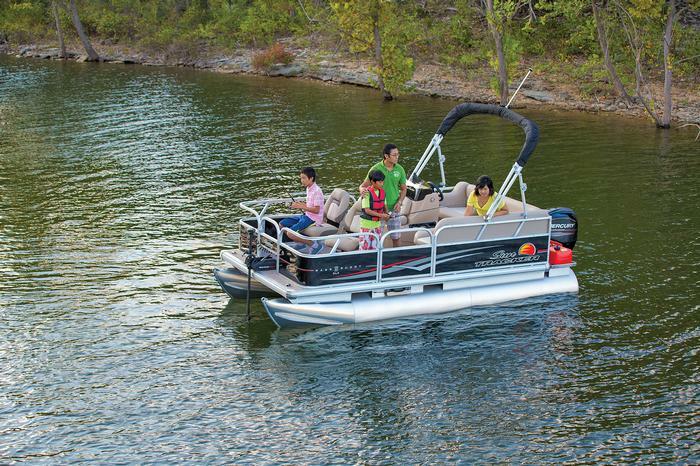 Editor's Note: See last year’s picks of the litter, 10 Top Pontoon Boats: Our Favorites, and be sure to check out the Top 10 Pontoon Boats of 2016.